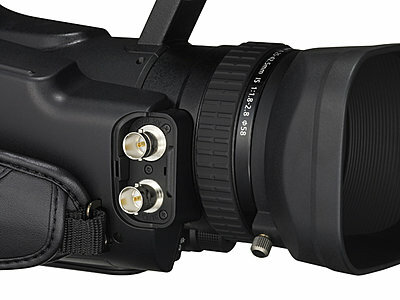 LAKE SUCCESS, N.Y., August 31, 2010 – Canon U.S.A., Inc., a leader in digital imaging, today announces the new Canon XF105 and XF100 Professional Camcorders for mobile HD video capture in a compact form factor. Canon’s smallest professional camcorders, the new XF105 and XF100 utilize the same Canon XF Codec featured in the Canon XF305 and XF300, introduced earlier this year. The Canon XF Codec is an MPEG-2 4:2:2 50Mbps codec used for exceptional high-definition image quality, full non-linear editing (NLE) systems compatibility and efficient, robust workflow. 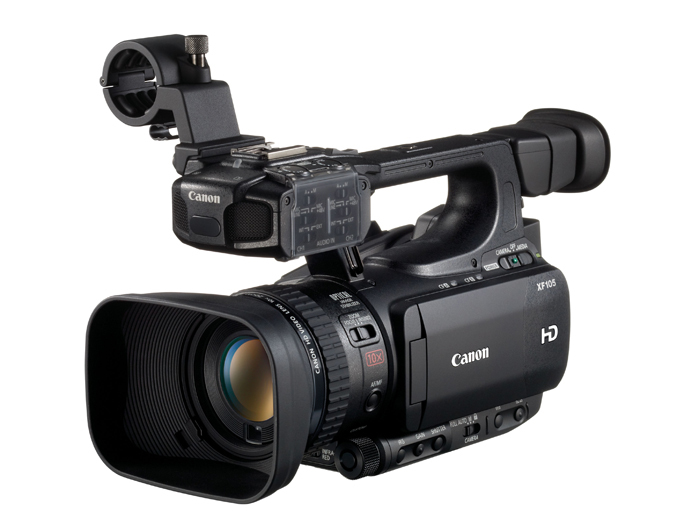 These camcorders include in-camera features enabling the easy set-up and capture of high-definition 3-D video when two XF105 or XF100 camcorders are paired, as well as Canon’s built-in infrared low-light feature enabling the capture of HD video in complete darkness. Both models record to Compact Flash (CF) cards and feature hot-swappable card slots for maximum performance. 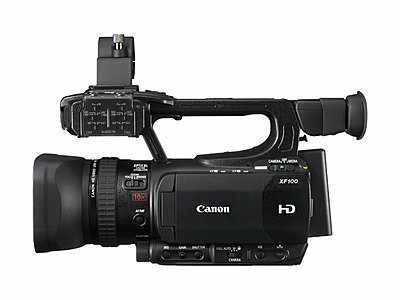 Differentiating the two models are industry-standard HD-SDI output and genlock in/SMPTE time code (in/out) terminals available on the Canon XF105. 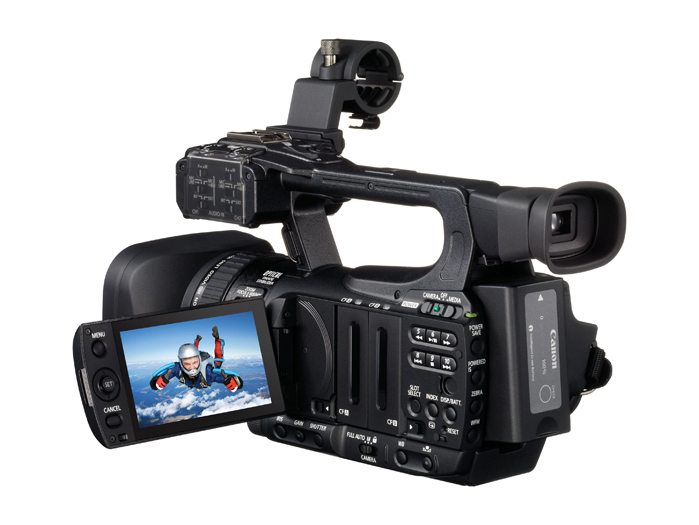 The XF105 and XF100 camcorders are ideal for Electronic News Gathering, documentary and independent filmmaking and event videography. The Canon XF105 and XF100 Professional Camcorders feature a Genuine Canon 10x HD Zoom lens which provides the mobility and optical performance required by the most demanding professionals. Each model includes a Canon developed and designed native Full HD 1920 x 1080 CMOS image sensor and the new Canon XF Codec for extreme color detail required for accurate chroma-keying, color-grading and compositing for digital filmmaking. For finer transitions in tone and color, 4:2:2 color sampling offers twice the color resolution of HDV and other 4:2:0 formats. And to maximize compatability with existing industry infrastructure, video, audio and metadata are combined in an MXF (Material eXchange Format) File Wrapper, a widely supported open-source format. The Canon XF Codec is currently compatible with leading software programs widely used within the video production and broadcast industries including those available from Adobe, Apple, Avid, and Grass Valley. 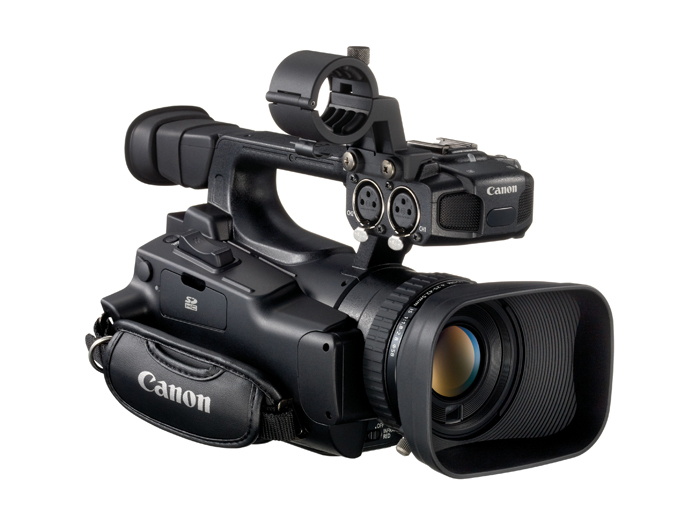 To maximize the camcorders’ adaptability across various production environments, Canon has equipped each model with the ability to record at multiple bit rates, resolutions and variable frame rates for slow and fast motion. The Canon XF105 and XF100 Professional Camcorders feature a Genuine Canon 10x HD Zoom lens with a 35mm equivalent zoom range of 30.4mm – 304mm. For professional looking results, both models offer an eight-blade iris which yields natural, smooth background blur with reduced lens diffraction. The lens also features a SuperRange Optical Image Stabilizer (OIS) system featuring Dynamic and Powered IS modes for optimal performance in the greatest variety of situations. The proprietary Canon DIGIC DV III Image Processor and Canon Full HD CMOS Image Sensor render native 1920 x 1080 HD video, capturing natural, lifelike colors with remarkable tonal gradations and detail. The DIGIC DV III Image Processor also powers Canon’s innovative Face Detection Technology, an autofocus option that can significantly reduce the effort required when camera operators work alone, such as in news gathering applications. Weighing less than 3lbs, these models are designed to maximize comfort while shooting and enable fast on-the-go recording with both a top and side grip option. Eachcamcorder also features a convenient, freely rotating 3.5-inch, 920,000 dot LCD monitor and .24-inch 260,000 electronic viewfinder with approximately 100 percent field of coverage. The LCD monitor provides a display of the camcorders’ built-in waveform monitor to aid in achieving accurate exposure while shooting. Additionally, the LCD can show peaking, edge-monitor-focus and magnify the image, enabling users to confirm critical focus, an essential objective in all HD production. Canon offers built-in features to assist with 3-D production, including OIS Lens Shift to aid in optically aligning two XF105 or XF100 camcorders and a Focal length Guide for displaying the zoom position of each camera in relation to each other and calibrating the zoom distance. This adjustment can be done through the menu system while the camcorder is mounted to a rig or tripod. Once aligned, the amount of the angle-of-view change is displayed after zoom adjustment, preventing camera misalignment and simplifying adjustment. The Canon XF105 and XF100 include an infrared feature enabling the capture of HD video shooting in conditions with little tozero ambient light, which is ideal for Military and Law Enforcement markets, as well as Nature and Wildlife videographers. The XF105 and XF100 also feature an infrared emitter with a diffuser as well as a Green or White color option to shoot pleasing infrared imagery even in complete darkness. Both the Canon XF105 and XF100 are scheduled to be available in the first quarter of 2011. The Press Release lists CompactFlash for recording media, but if you look at the first picture (20100831_loRes_xf100_frontR.jpg), the camera has an SDHC logo on its side, just above the handgrip strap. that is probably for stills or for custom preset saves like with the other Canon camcorders. The CF card slots are on the left side of the body. I'm guessing you would have posted if there was anything listed but no MSRP included with that? Only a single 1/3" CMOS sensor? I guess I waited 2 years for nothing. Depending on the MSRP, this could be one killer little camera. I don't see any ND on the camera, but if the other switches are user friendly (gain, iris, shutter) it might not be that big of a difference. Something to watch. While there are things I don't think are perfect with this series or the XF300 series cameras, I do think Canon is making some very wise moves. I really hope & assume that they're also working on something between their video & still departments to release a large sensor video camera that takes SLR lenses, much like the ones the Panasonic & Sony have teased. Even still, I think there is a large market of people who don't need a shallow DOF & these XF cameras will probably fill that gap, but probably only for people who haven't already jumped on P2 or SxS. Maybe they see it as a Tapeless XH-A1? Around the $4,000 mark? I think that'd be about right. Maybe a bit less because of the lack of 3 sensors when the Sony NX5U has it at the 4K mark. I'd love to see it at $2500 since they are advertising the 3D aspect and expect you to buy two. Makes for an interesting comparison to the NX5U. The NX5U has 3 1/3" sensors (vs the XF100/105's one) and the NX5U lens is 20x (about the same as the XF300/305) vs the 10x for the XF100/105. But then the XF100/105 has support for 4:2:2....will be interesting to see how people compare/trade-off these differences. TOKYO, August 31, 2010-Canon Inc. announced today that it has successfully developed the world’s largest*1 CMOS image sensor, with a chip size measuring 202 x 205 mm. Because its expanded size enables greater light-gathering capability, the sensor is capable of capturing images in one one-hundredth the amount of light required by a professional-model digital SLR camera. I sure wish it had a higher zoom lens though. For $4000 it should be a three-chip camera. Hopefully it will be priced to compete with the Panasonic HMC40, but I kinda doubt it will be that cheap. I'm guessing around $3000 for the XF100 and an extra $800 to $1000 for the XF105. I'm really glad to see a mid range option for tapeless HD recording. It certainly won't be that sensor; the huge sensor discussed in this thread is larger than this little camera will be! The other sensor announcement from Canon in the past week is discussed here (and I'd wager this won't be the sensor in this camera either): Canon develops APS-H-size CMOS of 120 megapixels! Looks like an HV40 on steroids. Interested to see the price point. It's labeled a Professional Camcorder and given the feature set, I accept that. Given that it's being announced by Canon's Consumer Imaging Group however, it is likely the sensor and lens is the same as found in the HF-S21 / 20 / 200. Indeed, I note the lens has the same 58mm filter thread size as found on the HF-S21 / 20 / 200. If this is Canons idea of what it takes to turn one of their consumer cameras into a pro model, it is a far more convincing effort than the Sony HDR-CX550 --> HXR-MC50E derivation. In Canons case they actually added a whole bunch of pro features. Last edited by Bill Koehler; August 31st, 2010 at 04:43 PM. Reason: More detail. Given that it's being announced by Canon's Consumer Imaging Group however, it is very possible the sensor is the same as found in the HF-S21 / 20 / 200. Given it's low resolution (only slightly larger than the 1920 x 1080 it actually uses) the CMOS in the XF10X was probably developed primarily for video, while the CMOS in the HF-S21 is a hybrid intended for both stills and video.